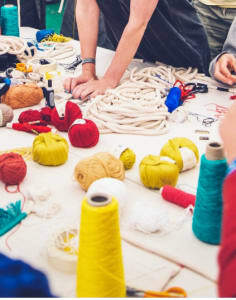 Alongside Eleanor's main practice, she also teaches a variety of rope and textile workshops both at EB HQ and in partnership with others. Recent clients have included Hole & Corner Magazine, Darkroom, Port Eliot Festival, Topshop, Shoreditch House and the V&A. 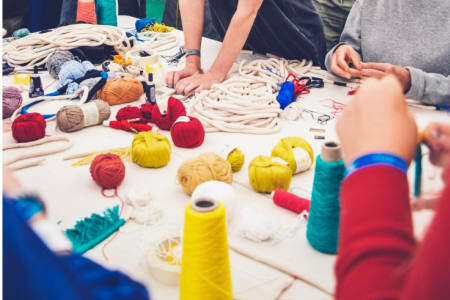 Eleanor's workshops are a fun introduction to jewellery making with rope and textiles, perfect for anyone who fancies having a go with lots of hands on help. I had so much fun at the workshop learning different techniques to making a necklace with rope and textile. Is so rewarding walking out from the workshop with a necklace that I learned and made in the 2.5 hrs. Would definitely recommend! Very nice workshop, I enjoyed it a lot. I’ve learn a lot about working with a rope, and different colour combinations. There were teas and poppy cake the host baked! The only issue for me was how to get to the venue - it’s very out of the way. I would go to another one by the teacher. It was a great course and fun to learn the different techniques. I very much enjoyed it and the teacher was very helpful. My only thought was that it could have been slightly longer, as there were a few techniques I would have still liked to learn but we sadly didn’t have enough time. Other than that it was really lovely!